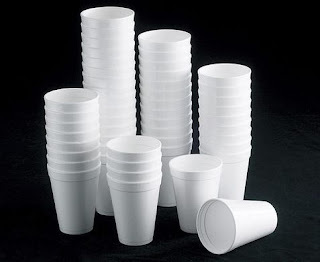 WARNING: Styrofoam is one of my Pet Peeves. First off, I want to repeat what I have said and written many times. Good stewardship of the environment SHOULD NOT be a political consideration. Taking care of the planet from which we get everything we eat and drink is just common sense. Yup, I am well known as a greenie - a tree hugging old hippie who walks to work and rides an electric motorcycle. You know who raised me to be one? An ultra conservative, Republican mama - she is the one who had me read "Silent Spring" by Rachel Carson when I was in the 5th or 6th grade. Mom taught me about recycling before it was popular. She was a life long user of Amway's SA-8 laundry soap because it didn't pollute ground water. My mom was taught to take care of the Earth by her mom - who was equally conservative and was raised on a farm and taught to take care of her source of food and drink. Can we please put aside politics and just talk about common sense?